Most years at Christmas time I try to get around to making a Gingerbread House. It’s one of those traditions my kids just love. This year I had a house full of 6 kids ranging from 7 to 12 that worked in pairs to create 3 beautiful houses. It was a fantastic activity that they all enjoyed and kept them entertained for hours as the planned and meticulously decorated their creations. In our southern hemisphere climate it can be a challenge though. 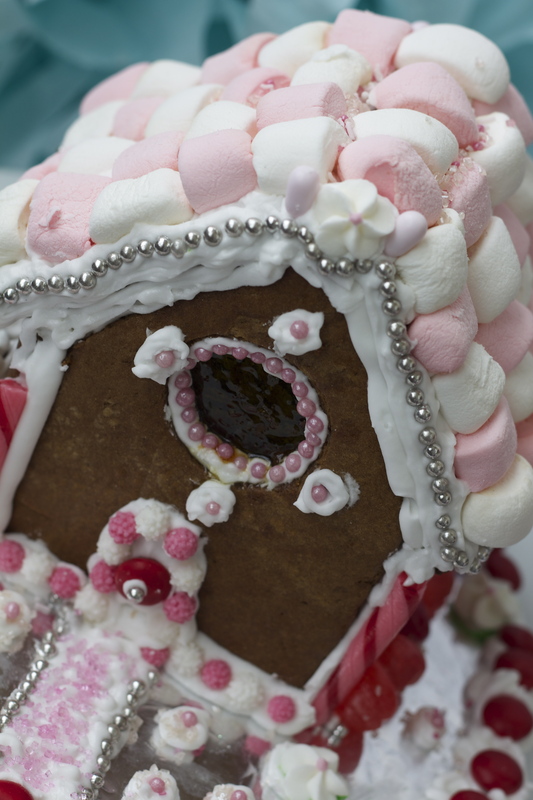 Usually December in Auckland is hot and humid and some of my Gingerbread houses in the past haven’t faired well. My last attempt I’m sure would have been condemned by the local council and was only held up by lots of internal cheats like cans of food keeping the roof from caving in. This prompted me to make a much improved house this year and of course it starts with the Gingerbread. I found this recipe from Sweatopia worked really well. In fact the whole post and video were really helpful. It needs to be strong and humidity proof. Sometimes that doesn’t equal great taste but we liked this recipe. The molasses is a good complement to the sweetness of the icing and candy. If you don’t like the taste of molasses golden syrup, corn syrup or a combination of the two should work. 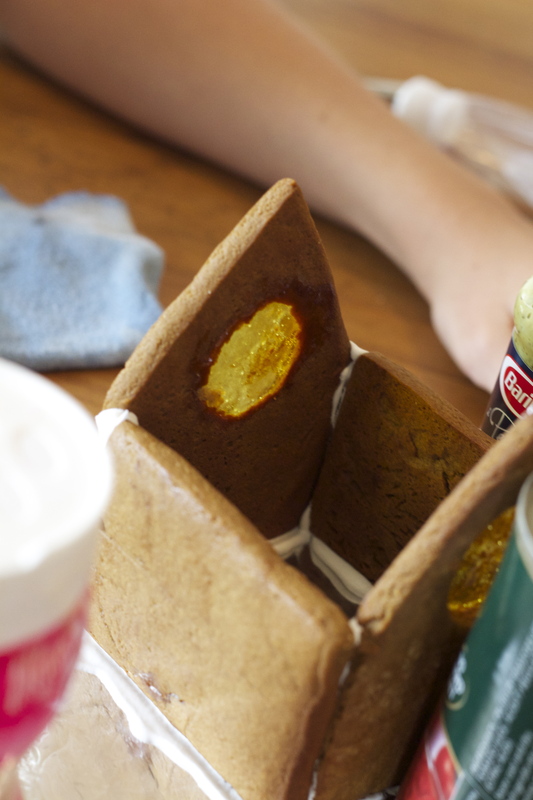 Though your gingerbread will be a lot lighter in color. This is a technique that I saw years ago and have been meaning to try and finally did this year with quite a bit of success so I definitely recommend trying it. When your gingerbread walls are cut out use a small cutter (I’ve used a small circle and a small snowflake) to cut out windows. Then using a mortar and pestle smash up a few boiled sweats, clear if you want transparent or colored for the more stained glass effect. Sprinkle the crushed candy into the window spaces and bake as normal. Allow the pieces with candy windows to cool completely before removing from the tray. Also a word of warning the candy windows can be quite sticky and I found I was able to remove them more easily from the baking sheet if I used a silicon liner rather than just waxed paper – that tended to stick to the candy. You’ll get a lovely translucent glow through your house and if you wanted you could put electric tea lights inside to even light it from within. Unfortunately in my experience the glass doesn’t last too long – a couple of days at most – then it will start to melt. Roll the gingerbread quite thick, about ¼ of an inch, much thicker than for cookies. I also used Sweatopia’s royal icing recipe which worked really well. The addition of extra cream of tartar and Wilton’s meringue powder makes an icing that sets really hard and keeps your house together. When constructing your house give your self plenty of time between each stage. The longer you can leave the walls to dry before you put on the roof the better and stronger house you will have. What I’ve found with party’s follows with Gingerbread Houses – having a color scheme and sticking to it generally gives you a better look. This is a bit of a hard concept to get across to kids it they are helping you so I usually just let them go for it and you’ll be amazed what they come up with. I’ve included my own template for a small house. If you have a group of kids this is a good size and you can make four out of the Gingerbread recipe above. What a great post! Such great explanations, and the houses turned out to be so cute! Glad you liked the videos and recipes and hope to see more of your creations next Christmas. 🙂 Happy New Year! Thanks Marian for taking the time to reply. We hope to make it a pre-Christmas tradition but might try and get some early practice in with a Halloween haunted gingerbread house.